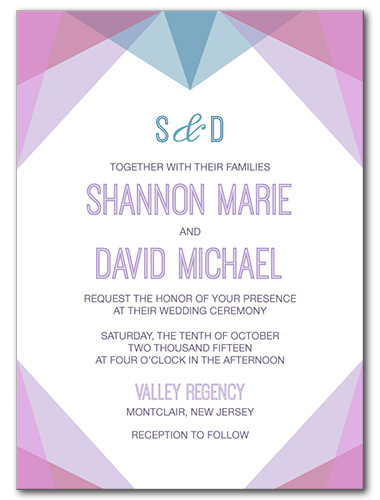 ​Bright and colorful enough for any spring wedding, but simple enough for vertically any theme, our Modern Deco wedding invitations are a beautiful addition to any stationary ensemble. Pinks, blues, and purples mingle together in a contemporary pattern with geometric shapes which blend into each other in a brilliant display. Pair with your choice of wedding font and personalized message to make the design your own. Table cards, response cards, and save the dates are also available to complete your selection. Modern Deco Invitation For the best experience, we recommend personalizing your stationery on a desktop computer.